Sleep: We all need it, especially growing children. Health experts recommend that kids ages 14 to 17 get more than 8 hours of sleep per day, and that 11- to 13-year-olds get more than 9 hours. But the vast majority of kids aren't getting nearly that much, and a new study says it's putting their heart health at risk. In a study of 829 teens, researchers from Kaiser Permanente Northern California took a look at how long they slept each night and the time spent asleep between first falling asleep and waking up for good. They didn't rely on what the teens told them; instead, they used a device worn on the wrist to measure sleep and physical activity. They also measured the teens' body fat, blood pressure, lipids, and insulin resistance. Inadequate sleep was common -- only 2.2% of the study participants were getting the recommended amount of sleep each night, and 31% slept less than 7 hours each night. 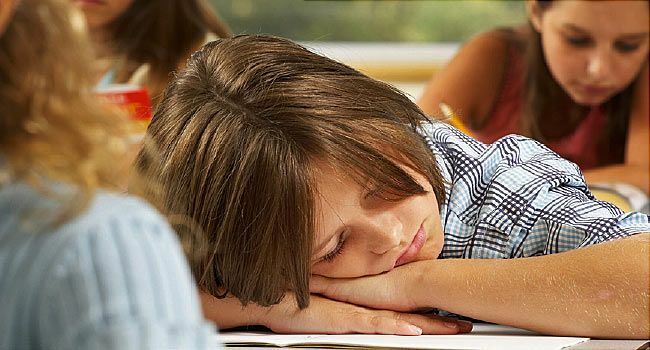 The teens who got less sleep and had lower sleep efficiency were also the least heart-healthy, with more body fat, higher blood pressure, and lower levels of HDL ("good") cholesterol. Even after the researchers adjusted for the teens' physical activity level, amount of reported TV watching, and diet quality, poor sleep was still linked to worse measures of heart health. preservation mode, which means making more of the substances your body needs when it's under stress. For example, your blood sugar levels rise, which makes you insulin-resistant and puts you at greater risk of diabetes." About 5 years ago, Watson noticed a worrisome trend -- more and more teens were coming to see her with high blood pressure and high cholesterol. So she created UCLA's Teen Heart Health Program, in which teens teach their peers about heart-healthy behaviors. "We've found that teens already know what to eat, how much they should be exercising, and not to smoke," Watson says, "but the thing they don't usually know about is how to get the right amount of sleep." Help your teens get the sleep they need with some pointers from Watson. 1. Isolate the electronics. Power down devices 30 minutes before bedtime, and have your teen put her phone, laptop, tablet, and any other devices somewhere besides her room. "Just knowing that a device is there and that they can reach over and look at it can keep them awake," says Watson. "Also, light-emitting screens block the release of the sleep-promoting hormone melatonin." 2. Go caffeine-free after 3 p.m. "Make sure your teen knows that means not just coffee, but things like teas and energy drinks," Watson says. "Most caffeine is out of your system after about 4 to 5 hours, but in some people, it lingers longer." 3. Set sleep goals. Have your teen use an alarm on a smartphone to remind her when it's time to start settling down for bed. She can also make a pact with a friend to turn off phones and say goodnight at the same time. 4. Keep a regular schedule. Don't count on letting them "catch up" on sleep over the weekend. "Cumulative sleep is important, but you also have to get adequate sleep nightly," says Watson. Pediatrics: "Objective Sleep Characteristics and Cardiometabolic Health in Young Adolescents." Karol Watson, MD, professor of medicine, David Geffen School of Medicine, UCLA; director, UCLA Women's Cardiovascular Health Center.